What goes great, what did not go as planned, and everything in between, about the making of your UWOL 51 films. Hope all of you have found an idea for your entries. Your imagination is the limit of how you interpret the theme. Don't be afraid to ask if you have any questions. 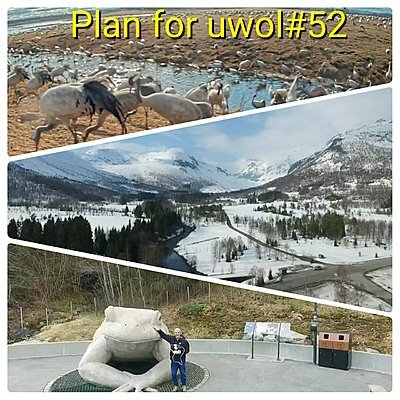 My plan for this round of uwol is to record cranes in Sweden and to record amphibians in Norway. Did an attempt this weekend, but the toad must have warmer weather before it starts walking towards the spawning area. First coming Friday I travel to Hornborgasjön in Sweden and the cranes. Photo is from this weekend shoot and the cranes is a snapshot from webcamera. Sounds like an interesting plan, Geir Inge. This was an easy one for me (to come up with a plan) as I live in an area where an entire civilization was built on the concept of "sacred geography" or religious harmony with the natural world. People have written huge volumes on this, so I hope I can keep it down to 4 minutes! I see a very unique perspective on the theme every day. I've even got an idea on how to incorporate a unique twist. If it all works out, I'll be able to combine filming with some spectacular exploring in areas that very, very few people even know about including a few forgotten places that no one knows about. Looks like I'll be pulling out my machete and getting my "Indiana Jones" fix in remote places far from civilization. Keep your fingers crossed as I plan to do some serious exploring. No matter what happens, this is going to be a lot of fun. Glad we have 2 months for this one as I'm in the US now and won't be home until tomorrow. I was going to bring back my Sony Ex1r, but decided I'll continue working with my Sony AX100 because of its small size. I did purchase a bunch of extra batteries and a tiny tripod to carry when I'm off in the hinterlands! I'm also bringing back a Kessler slider to maybe add some production value along the way. Last edited by Phil Murray; April 8th, 2019 at 08:21 AM. As for the cranes' area, this is wetland that has been destroyed, then repaired. The toads have a dangerous road to the spawning area, almost destroyed by man. Then I have a third location I'm thinking of, so we'll see how it gets in the end. Phil Murray, I'm looking forward to your movie. What you tell makes me curious, your plan sounds very exciting.